Background: Acupuncture is still a controversial topic, as methodologic problems associated to its research impair scientific progress. Besides effective allocation of acupoints and double blinding, quantification of its effects is still a problem that has to be addressed. In particular, the effects of acupuncture need to be quantified more clearly for relieving pain and reducing inflammatory effects associated to Rheumatoid Arthritis (RA). We aim to study the effects of acupuncture resorting to an algometry device specifically designed to assess the pressure tolerated by RA patients. Methods/Design: A quasi-experimental nature design was developed. Fourteen RA patients with a Traditional Chinese Medicine (TCM) (Heidelberg Model) diagnosis of a so called pivotal or turning point syndrome, and meeting the criteria of the American College of Rheumatology, received three acupuncture treatments in one week with a standardized treatment. A newly developed pressure algometry device, designed to assess the tolerance in hand pain in RA, was tested. We compared the outcome of clinical acupuncture, as measured by Pressure Algometry (PA) and Visual Analogue Scale (VAS). Results: The patients tolerated higher pressure on the hands (p=0.001) as well as improved VAS scores along with the treatment (p=0.005). All 14 patients displayed improvements in PA, while 11 improved their VAS scores. Out of the remaining, two patients had their VAS score unaltered and one (who also displayed the smallest improvement in PA) worsened slightly. Discussion: The findings of this study suggest that acupuncture effects in hand pain relief can be measured by the PA device. This opens the door to quantify the differences between the tolerated hand pressure before and after the acupuncture treatment to one specific TCM syndrome designed as turning point in a future double blinded acupuncture study on pain in RA patients. Rheumatoid Arthritis (RA) is a chronic systemic inflammatory autoimmune disease. Over 90% of patients with RA have involvement of the wrist and small joints of the hand, including the knuckles and the middle joints of the fingers involving destructive polyarthritis of the synovium. Pain is one of the major symptoms impacting an RA patient’s quality of life and leads in around 30% of the patients to limitations in daily life activities [1-3]. About 60 to 90% of patients with RA dissatisfied with conventional treatments side effects tend to use complementary and alternative medicine, including acupuncture [3-6]. Acupuncture in patients with RA can have the following effects: reduction of pro-inflammatory cytokines IL-1 and IL-6 and increase of cytokine inhibitors IL-4 and IL-10 ; induction of the expression of vasoactive intestinal peptide, an anti-inflammatory neuropeptide ; inhibition of the function of synovial mast cells (which are substantially involved in the initiation of inflammatory arthritis) and restoration of the hypothalamic-pituitary-adrenal axis . Acupuncture generally stimulates the vegetative nervous system, which leads to the release of endorphins and other neurohumoral factors as well as to changes in the treatment of pain in the brain and spinal cord and to an increase in local microcirculation that helps to reduce edema [10,11]. Although RA is classified as a single disease in western medicine, in classical Chinese medicine it is believed to be the result of an invasion of the external pathogens (wind, cold, heat and damp), reactive heat with yin affection, qi and xue deficiency with stasis and phlegm, as well as of the deficiency patterns (liver and kidney yin or yang deficiency) [12-16]. Neurological and immunological RA phenomena can be explained by the cold (designated algor on the HM) aggression passing the skin (Biao) to reach the inner tissues of the body, while overcoming the six defense levels explained in detail by the Shang Han Lun theory called Algor Leadens Theory (ALT) by the Heidelberg Model (HM) of TCM in our previous paper . RA manifestations can be characterized in different syndromes according to this mathematical regulative model as a deviation from the regulated state . Pain is inherently subjective and pain measurement in patients with RA relies primarily on self-reports or by simple palpation of the joints . Although self reported pain intensity is important, it is a composition of the physiological and psychological features of the patient and their health problem that is further mediated by social aspects, which can make it difficult to interpret the responses . Physicians often assume that inflammation is the main determinant factor of RA pain intensity. However more than one in ten RA patients that are shown to be in remission by the Disease Activity Score 28 (DAS28) still report clinically significant pain levels. The fact is that pain persists despite the absence of signs of inflammation . The magnitude of symptoms may not necessarily correlate with the severity of the underlying disease and symptoms may persist even when disease exacerbations have apparently settled. Pain and tenderness associated with the disease are not only present in directly affected joints but also in adjacent, apparently normal, tissues. These symptoms can occur spontaneously, can be evoked by gentle stimulation of the joint when it is moved within its normal working range or can be indicative of changes in their central pain modulation which then becomes a primary cause of pain, possibly outlasting the inflammatory activity [2,18]. In the classical Chinese medicine language, the occurrence of chronic pain in RA patients is explained as a dysfunctional pattern/sign or symptom of the neurovegetative system and is frequently accompanied by signs of yin deficiency symptoms, reactive heat and emotional imbalances such as anger, sadness or exhaustion . Thus, objective pain measures are invaluable as they reflect different perspectives of the health condition. Therefore, measuring hand pain is an important component of clinical practice; its importance is evident in the frequency with which it drives healthcare utilization as well as its impact on quality of life . Pressure Algometry (PA) has been used for the investigation of pain syndromes involving tenderness to assess different aspects of pain and tissue sensitivity to pressure in various rheumatic conditions . This instrument has demonstrated an outcome that physicians are able to use in both clinical as well as research settings to measure and quantify an individual’s pain experience by determining the pressure pain threshold of specific muscle and bone locations, the point at which a subject perceives pain upon the application of a pressure or force stimulus . The PAs that are currently available rely on either a calibrated spring or an electronic force transducer. They are sensitive and accurate but expensive and fragile . In routine, clinical practice physicians need inexpensive, robust PA as a practical alternative for the assessment of tenderness in a wide range of patients. To observe quantitatively the differences between the tolerated hand pressure before and after the acupuncture treatment, we need an inexpensive self-assembly device. In that way, we developed a specific PA, adapted to a computerized system, with the aim to objectify the variability effects of a standardized acupuncture treatment, by a physically measurable parameter. Therefore, we compared the outcome of clinical acupuncture, as measured by VAS and PA, in a sample of 14 RA patients and a specific vegetative functional state called turning point syndrome, to see whether the methods lead to correlating results. We developed a quasi-experimental nature design study to assess pain severity objectively in RA patients by a developed PA device. The patients were recruited by using media resources distributed to RA national associations and locally. We have included patients with RA of the hands according to the inclusion criteria. The protocol for this pilot clinical trial has undergone ethics scrutiny and has been approved by the ethics review boards of the Faculty of Medicine, University of Coimbra (ref. CE-048/ 2015). The trial registration number is NCT02553005. Inclusion criteria: The patients were included if they: had previously signed an informed consent; presented with active RA fulfilling the American College of Rheumatology criteria; had impairment of hand strength with or without pain in the hands during the grip test; had chronic pain, either persistent or intermittent over a minimum period of three months prior to recruitment; had current pain greater than 30/100 mm on a VAS within the last 24 hours despite medication and stable dose treatment for at least 3 weeks and the TCM diagnose of turning point syndrome, determined by a well-trained TCM doctor. Exclusion criteria: Patients were excluded from this study if they; were under the age of 18 years; previously had acupuncture; had localized skin infections; had severe chronic or uncontrolled co morbid disease; or had mainly the aim to get benefits. The PA has been widely used in a variety of studies to measure the pressure-pain stimulus response, in various rheumatic conditions . However, according to our previous research, it is not from our knowledge the existence of a validated PA device to RA patients, that would allow us to measure the force applied in two different situations: the force applied at two points, considering the hand grip and the thumb resistance force. 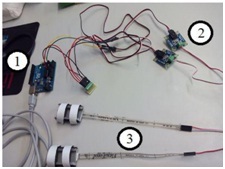 In strict cooperation with the Biomedical Engineer Department of the Engineer Faculty of the University of Porto, we developed a novel pressure sensitive sensor device which allows to assess and precisely determine the hand pressure tolerated (in Kgf) until the pain starts during the hand grip (Figure 1). All the software development was carried on Lab VIEW 2013 SP1 environment (Figure 1), in order to obtain an application to communicate with the Arduino Uno R3 Board (Number 1) for control and acquire signals between the two adapters FlexiForce Adapter (Number 2) for signal conditioning from the sensors circuits (Number 3). The two FlexiForce piezoresistive sensors (Number 3) are adapted by the physician to the surfaces of the joint between carpal bones (hemato and trapezius) and respective metacarpal bones (fifth and second metacarpal bones). When the sensors are pushed, sensors and time values are paired and stores as a pain event. At the same time in the computer program a text file registers the sensor value and a graphic with force variation through measurement time is automatically created. 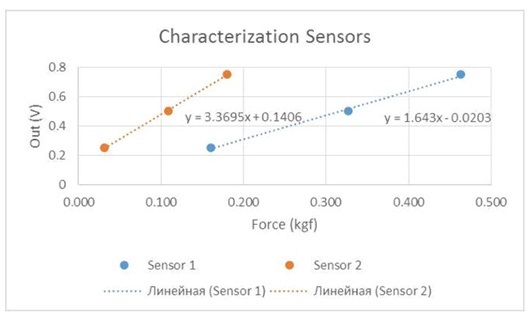 The sensors were tested in order to obtain the individual characteristics of each sensor (Figure 2) required to transform the voltage signal of the force applied. For the control interface an application was developed in Lab VIEW 2013 to establish communication with the Arduino Uno R3. To this end LIFA library (LabVIEW Interface for Arduino) was implemented on Arduino using analog inputs A0 and A1 of the same. The Arduino and the laptop computer on which the application was installed were connected by USB cable. In this work, measuring range was set to a maximum of 1,757 kgf/cm2 applied in each sensor. All obtained values and graph plot are stored, respectively, on a txt file and a bmp file. All participants were guided and informed clearly to identify the moment when the stimulus causes the painful sensation. At this time point, the pressure was stopped and maintained until the device recorded its value. The same process was repeated three times for each patient, with one minute break between the assessments. This measurement was carried out always before and after the treatment intervention. The subjects were instructed to give the indication to stop precisely at the moment they felt the sensation was changing from strong pressure to pain. The maximum force pressure values of the sensors system were used for the data analysis. To improve reliability of PA it was recommended that one examiner should carry out all measurements. Prior to the start of the trial, investigator 1 underwent training sessions in the use of the PA with a healthy volunteer. During these sessions, the investigator practiced keeping the sensors between the base of the second and fifth metacarpal bones. After he positioned the sensors he started the computer program that recorded the data obtained from the plate and applied force at a constant rate until the moment that the patient used a verbal command to stop the pressure. Investigator 1, a qualified and experienced TCM Master, assessed the RA features based on the Heidelberg Model of TCM and the pain in the hand by using the PA device and the VAS scale (T0). The same investigator performed all measurements with the PA.
A second investigator, a physician and experienced acupuncturist, performed the respective standardized bloodletting acupuncture technique to the selected acupoints. Five minutes after each acupuncture intervention, the first investigator assessed the immediate effects repeating the tests VAS and PA (T1). To evaluate the short term effects, all patients were subjected to this process again 24 hours after the first intervention and measurements were taken again before acupuncture and five minutes after (T2 and T3, respectively). The third and final acupuncture intervention was done 72 hours after the first intervention and pain tests were performed and assessments made before and five minutes thereafter (T4 and T5, correspondingly). For the treatment of this pathological picture we choose points of conduits/orbs that are affected in the turning point syndrome: Tk5 (TB5/SJ5, clusa externa and waiguan), C3 (HT3, mare minus and shaohai), R7 (Rn7/KI7, amnis recurrens and fuliu) and F39 (VB39/GB39, campana suspensa, xuanzhong) . We used the leopard spot technique (designation according to HM model of TCM), a bloodletting acupuncture technique that uses sterile subcutaneous needles (0.30mm×8mm) and that is clinically applied by pricking certain acupoints. An external computer specialist extracted the data from the informatic software and the statistical analysis was performed by the Laboratory of Biostatistics and Medical Informatics. A descriptive analysis of the data was done after checking for normality of the quantitative variables with shapiro-wilk tests and visual inspection. Normally distributed quantitative variables were described by their mean and standard deviation or by medians, first quartile and third quartile, ordinal or non-normally distributed variables by their medians, first quartile and third quartile and nominal variables by the number of elements of each category and corresponding percentage. The associations between qualitative variables were assessed with exact fisher tests, whereas paired sample tests (t-student and Wilcoxon, as appropriate) were used to compare how treatments affected the values of VAS and PA. Finally, the correlations between VAS and PA values were assessed by computing spearman correlation coefficients. The statistical analysis was performed in IBM SPSS statistics 21 and the level of significance was 0.05. Recruitment rate and baseline characteristics: A convenient sample of 14 patients with features of the turning point syndrome and RA who fulfilled the inclusion and exclusion criteria were recruited between June and December of 2015. Data of the demographics and clinical characteristics of the participants are summarized in table 1. We compared the pain data assessed by subjective report of VAS and by a physically measurable parameter (using the pressure algometer) before and after all the treatments. The variability of the VAS score and PA outcome in patients at baseline as well as 24 hours (second treatment) and 72 hours (third treatment) are presented in table 2. 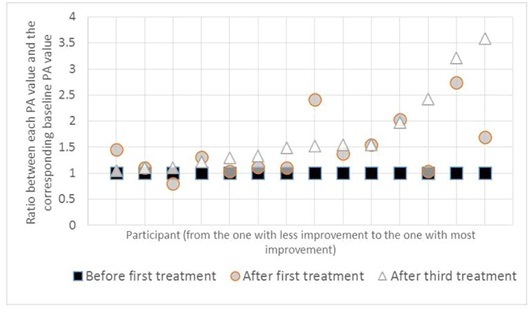 The improvements induced by the treatment, expressed by the difference between the values obtained after the third treatment and before the first treatment, are shown in the last row of the table 2. Figures 3 and 4 summarize the patient’s progress through the treatments. The PA values obtained before the first treatment (baseline), immediately after the first treatment and immediately after the third treatment are illustrated in figure 3. For easier visualization, the three corresponding PA values for each participant in the study were divided by the baseline values. 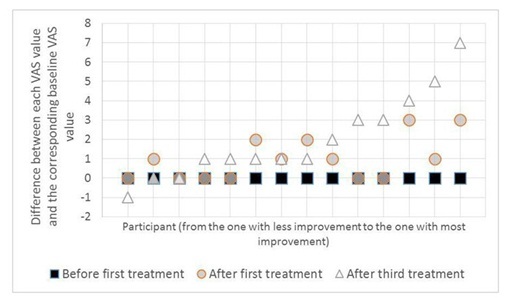 Each value in the x-axis represents one of the 14 participants, which were placed in increasing order of improvement in PA values between the baseline and the moment after the third treatment. Likewise, the VAS values can be observed in figure 4. Once again, they were normalized, but this time the y-axis represents the difference for each patient between the VAS value at baseline and each of the other VAS values: in other words, the symmetry of the decrease in VAS. In both plots, higher values can be interpreted as improvements. Note that the orders of the patients in the plots do not coincide. As can be seen in the figures 3 and 4, all patients displayed an increase in PA values between the baseline and the end of the third treatment, while 11 improved their VAS scores - out of the remaining, two patients had their VAS score unaltered and one (who also displayed the smallest improvement in PA) worsened slightly. This study was performed to evaluate the feasibility of a PA device, which was specifically designed to quantify pressure pain thresholds and possible effects of acupuncture . PA has been widely used in a variety of studies to measure the pressure pain stimulus response of subcutaneous muscles, as an abdominal examination value ; for the assessment of muscle hyperalgesia and a few number of studies used pressure algometer to assess the pressure pain thresholds in the temporomandibular joint and masticatory muscles [23-25]. In recent years, expensive and valid electronic pressure algometers have already been introduced on the market [22,26,27]. Additionally, several glove prototypes have been developed to assess the discomfort threshold level at 12 zones on the palmar surface of the hand . These devices were not used to test the pressure pain threshold by the hand grip in RA patients. We have no knowledge of existing PA devices that have been tested and validated to assess and precisely determine the process of determining the hand pressure that can be tolerated, as well as identify when the pain starts, all while being gripped by the RA patients themselves. Creating such a device was one of the objectives of the future RCT that we intend to develop . The PA device that we developed was created specifically to assess the pain tolerance threshold of RA patients with hand pain whose features are related with a specific TCM diagnosis. We tested the new PA device in a small group of 14 RA patients that fulfilled the research criteria’s. To reduce possible risks of mistakes, the examiner had intensive training to use the device and the same examiner assessed all of the participants. The patients showed an increase in PA values and a decrease in VAS values (Table 2) during the progression of the treatment. The VAS values decreased significantly in most patients by the end of the third treatment. The change post treatment, shown in the last row of the table 2, is promising and we can see that each treatment resulted in an improvement of the clinical parameters (Table 3). The only patient that presented an increase in the VAS value was an older patient and only two male patients remained with the same VAS scores. Throughout the period of acupuncture treatments, no complications were found. The increase of PA toleration can be correlated with the effect of the leopard spot technique at the chosen acupuncture points on the central vegetative nervous system and the induced mechanisms and is further supported by the decrease of the VAS-score. It is known that this technique increases local microcirculation by inducing a vegetative response and that it has the ability of alleviating pain . Acupuncture positively influences areas of the brain that reduce sensitivity to pain, stress and inflammation, by promoting the release of vascular and immunomodulatory factors and by improving biomechanical functions . Our results showed that exist a statistically significant association between the presence of nodules and an improvement in VAS, p=0.003 (fisher). Notably, all patients with nodules (11) improved and those without nodules (3) did not report any improvement. Recovering normal physiological functions induced by the nodules presence, bloodletting therapy can also accelerate the metabolism and stimulate the medullary hematopoiesis via neurohumoral regulation. This, therefore, improves microcirculation and vascular functions, stimulates blood regeneration and helps to rebuild homeostasis. By improving microcirculation, it can inhibit excessive inflammatory reactions and promote recovery . We observed an increase in the pressure tolerated by the hand (objectively measurement) and a decrease of the self-reported pain, assessed by VAS score (subjectively measurement). Our pilot study suggests that using the PA developed we can observe and measure objectively the individual hand pressure toleration variability of patients, before and after the acupuncture treatment. The data obtained with PA can be often quite variable. We recognize that such an instrument will have certain limitations as the non-applicability to other syndromes, not comparability with devices already created; we have no data enough to validate the specific device and also, the fact that it doesn’t have a patient controlled ‘stop’ button. Thus, we recognize that caution is required in the interpretation and reporting of clinical findings when using such device. However, in the future, we intend to use the device to support and quantify the effects of the acupuncture in the treatment of RA patients with one specific TCM syndrome, and the use of subjective instruments can limit the interpretation of the results. Unfortunately, the devices existing in the market are not adjusted to assess the force tolerated by the hand grip of RA patients with a specific turning point syndrome. On the basis of our methodology we keep the Traditional Chinese Acupuncture Practice characterized by a holistic approach to the management of the disease [19,32]. Based on the main characteristics, complaints and objective examinations of participants, a qualified and experienced TCM doctor established the functional diagnosis . In the present study, the clinical results show that the principle of point selection based on a specific TCM diagnosis including specific groups of signs and symptoms increases the effects of pain reduction and the toleration of hand pressure in RA patients. A main purpose of our PA is to develop basic evidence that this device can be used as step towards objective research on acupuncture and, by objectifying pressure tolerance, as a measure of pain reduction, thus validating the effects of acupuncture. In terms of sensory assessment, the detection of pressure pain thresholds may allow the development of mechanism-based therapeutic interventions that would specifically target the underlying pathophysiology . By using one objective assessment we can help to clarify and direct appropriate interventions in the treatment of RA patients. Translation of these and other sensory findings into clear clinical benefits and improved outcomes for injured people is an area for future research. Future studies using pressure algometry are required to determine whether the PA is reliable when used on RA patients and also whether the algometry displays adequate inter-investigator reliability. The findings of this study suggest that acupuncture effects in pain relief can be objectively assessed by the PA device developed. This opens the door to quantitative measurement of the pain improvement in future double blinded acupuncture studies on pain in RA patients. Conventional pressure algometry is unsuitable for assessing the clinical therapeutic effectiveness on pain of RA patients with a turning point syndrome. We had needed to create a new PA device that could meet our future goals. The PA device tested has proven to be correctly adjusted to quantify the pressure pain threshold by the hand grip. Based on the present data we are looking forward to using this instrument to do further investigation on the role of acupuncture in managing the symptoms of RA patients who are not willing to accept or react adversely to conventional pharmacological treatment, or who are seeking additional benefits from unconventional therapeutic combinations. Concomitantly this was a preliminary test study preceding a longitudinal pragmatic design using acupuncture, sham acupuncture and no acupuncture treatment to assess the long-term effects of acupuncture on hand pain, functional deficits and health related quality of life in patients with RA. S Seca designed the study and guided the experiment for the purpose of her ongoing PhD research. D Miranda collaborate as physicians and with the recruitment, the follow-up of patients enrolled into the study, the analysis and interpretation of data. The engineers R Correia and J Reis developed the pressure algometry device. The statistical analysis was performed by M Patricio from the Laboratory of Biostatistics and Medical Informatics. The authors gratefully acknowledge the support of Cara Nicholl, an American collaborator that reviewed the language. Horsten NC, Ursum J, Roorda LD, van Schaardenburg D, Dekker J, et al. (2010) Prevalence of hand symptoms, impairments and activity limitations in rheumatoid arthritis in relation to disease duration. J Rehabil Med 42: 916-921. Vladimirova N, Jespersen A, Bartels EM, Christensen AW, Bliddal H, et al. (2015) Pain Sensitisation in Women with Active Rheumatoid Arthritis: A Comparative Cross-Sectional Study. Arthritis 2015: 434109. Richmond SJ (2008) Magnet therapy for the relief of pain and inflammation in rheumatoid arthritis (CAMBRA): a randomised placebo-controlled crossover trial. Trials 9: 53. Wang J, Cui M, Jiao H, Tong Y, Xu J, et al. (2013) Content analysis of systematic reviews on effectiveness of traditional Chinese medicine. J Tradit Chin Med 33: 156-163. Lee MS, Shin BC, Ernst E (2008) Acupuncture for rheumatoid arthritis: a systematic review. Rheumatology (Oxford) 47: 1747-1753. Wang C, de Pablo P, Chen X, Schmid C, McAlindon T (2008) Acupuncture for pain relief in patients with rheumatoid arthritis: a systematic review. Arthritis Rheum 59: 1249-1256. Lee WY, Chen HY, Chen KC, Chen CY (2014) Treatment of rheumatoid arthritis with traditional chinese medicine. Biomed Res Int 2014: 528018. He T-F, Yang W-J, Zhang S-H, Zhang C-Y, Li L-B, et al. (2011) Electroacupuncture inhibits inflammation reaction by upregulating vasoactive intestinal peptide in rats with adjuvant-induced arthritis. Evid Based Complementary Altern Med 2011: 8. Gao J, Liu XG, Huang DJ, Tang Y, Zhou HY, et al. (2010) [Involvement of the hypothalamus-pituitary-adrenal axis in moxibustion-induced changes of NF-kappaB signaling in the synovial tissue in rheumatic arthritic rats]. Zhen Ci Yan Jiu 35: 198-203. Cheng KJ (2009) Neuroanatomical basis of acupuncture treatment for some common illnesses. Acupunct Med 27: 61-64. Doenitz CA, Anjos A, Efferth T, Greten T, Greten HJ (2012) Can heat and cold be parameterized? Clinical data of a preliminary study. Zhong Xi Yi Jie He Xue Bao 10: 532-537.
van Wietmarschen HA, Dai W, van der Kooij AJ, Reijmers TH, Schroën Y, et al. (2012) Characterization of rheumatoid arthritis subtypes using symptom profiles, clinical chemistry and metabolomics measurements. PLoS One 7: 44331. Zhang C, Jiang M, Lü AP (2011) Evidence-based Chinese medicine for rheumatoid arthritis. J Tradit Chin Med 31: 152-157. Lu C, Niu X, Xiao C, Chen G, Zha Q, et al. (2012) Network-based gene expression biomarkers for cold and heat patterns of rheumatoid arthritis in traditional Chinese Medicine. Evid Based Complement Alternat Med 2012: 203043. Wang M, Chen G, Lu C, Xiao C, Li L, et al. (2013) Rheumatoid arthritis with deficiency pattern in traditional Chinese medicine shows correlation with cold and hot patterns in gene expression profiles. Evid Based Complement Alternat Med 2013: 248650. Seca S, Kirch S, Cabrita AS, Greten HJ (2016) Evaluation of the effect of acupuncture on hand pain, functional deficits and health-related quality of life in patients with rheumatoid arthritis--A study protocol for a multicenter, double-blind, randomized clinical trial. J Integr Med 14: 219-227. Mutlu EK, Ozdincler AR (2015) Reliability and responsiveness of algometry for measuring pressure pain threshold in patients with knee osteoarthritis. J Phys Ther Sci 27: 1961-1965. Meeus M, Vervisch S, De Clerck LS, Moorkens G, Hans G, et al. (2012) Central Sensitization in Patients with Rheumatoid Arthritis: A Systematic Literature Review. Semin Arthritis Rheum 41: 556-567. Greten HJ (2007) Kursbuch traditionelle chinesische Medizin: TCM verstehen und richtig anwenden. Georg Thieme Verlag, Stuttgart, Germany. Polianskis R, Graven-Nielsen T, Arendt-Nielsen L (2002) Pressure-pain function in desensitized and hypersensitized muscle and skin assessed by cuff algometry. J Pain 3: 28-37. Vaughan B, McLaughlin P, Gosling C (2007) Validity of an electronic pressure algometer. International Journal of Osteopathic Medicine 10: 24-28. Ko S-J, Kim H, Kim S-K, Park K, Lee J, et al. (2016) Reliability and Validity of Modified Algometer in Abdominal Examination. Evid Based Complement Alternat Med 2016: 3052954. Finocchietti S, Graven-Nielsen T, Arendt-Nielsen L (2015) Dynamic mechanical assessment of muscle hyperalgesia in humans: The dynamic algometer. Pain Res Manag 20: 29-34. Bernhardt O, Schiffman EL, Look JO (2007) Reliability and validity of a new fingertip-shaped pressure algometer for assessing pressure pain thresholds in the temporomandibular joint and masticatory muscles. J Orofac Pain 21: 29-38. Alessandri-Bonetti G, Bortolotti F, Bartolucci ML, Marini I, D’Antò V, et al. (2016) The Effects of Mandibular Advancement Device on Pressure Pain Threshold of Masticatory Muscles: A Prospective Controlled Cohort Study. J Oral Facial Pain Headache 30: 234-40. Polianskis R, Graven-Nielsen T, Arendt-Nielsen L (2001) Computer-controlled pneumatic pressure algometry--a new technique for quantitative sensory testing. Eur J Pain 5: 267–277. Chantelau EA (2016) Conventional deep pressure algometry is not suitable for clinical assessment of nociception in painless diabetic neuropathy. Diabet Foot Ankle 7: 31922. Muralidhar A, Bishu RR (2000) Safety performance of gloves using the pressure tolerance of the hand. Ergonomics 43: 561-572. Karner M, Brazkiewicz F, Remppis A, Fischer J, Gerlach O, et al. (2013) Objectifying specific and nonspecific effects of acupuncture: a double-blinded randomised trial in osteoarthritis of the knee. Evid Based Complement Alternat Med 2013: 427265. Macfarlane GJ, Paudyal P, Doherty M, Ernst E, Lewith G, et al. (2012) A systematic review of evidence for the effectiveness of practitioner-based complementary and alternative therapies in the management of rheumatic diseases: rheumatoid arthritis. Rheumatology (Oxford) 51: 1707-1713. Chen PD, Chen GZ, Xu YX (2011) Study strategies for bloodletting therapy in treatment of acute soft tissue injuries. Zhong Xi Yi Jie He Xue Bao 9: 237-241. Porkert M (1983) The essentials of Chinese Diagnostics. Chinese Medicine Publications, the University of California, California, USA. Sterling M (2011) Pressure Algometry: What Does It Really Tell Us? Journal of Orthopaedic & Sports Physical Therapy 41: 623-624. Figure 1: Pressure algometer developed. The PA developed comprise: Number 1 - An Arduino Uno R3 for acquisition and control; Number 2 - two adapters FlexiForce Adapter for signal conditioning from the sensors; Number 3 - two FlexiForce piezoresistive sensors 25 lb/SQI (weight pounds/square inch), or 1,757 kgf /cm2 Tekscan company. Figure 2: Force sensors characterization with this equipment, the sensor system controlled and recorded the maximum pressure values by Kgf /cm2 that can be tolerated by each patient before the onset of pain in the hand. Table 1: Demographics and clinical characteristics of the patients with RA (n=14). Data are presented as mean ± SD (Standard Deviation), median (1st quartile; 3rd quartile) or number (frequency). NSAIDs = Non-Steroidal Anti-Inflammatory Drugs; DMRADs = Disease Modifying Anti-Rheumatic Drugs; VAS = Visual Analog Scale. Table 2: Self-report of patients before and after acupuncture treatment, assessed by VAS and PA values (n=14). Data are presented as median (1st quartile; 3rd quartile). The p-values were computed with paired sample t-Student tests or Wilcoxon tests, as applicable. Table 3: Pain values before and after acupuncture treatment. Data are presented as number (frequency). Citation: Seca S, Miranda D, Patrício M, Correia R, Kirch S, et al. (2017) New Pressure Algometry Device for the Quantification of Acupuncture Induced Pain Relief. J Altern Complement Integr Med 3: 019.